We’re taking a look at all our horses in turn to provide some insight into their characters and this time it’s the turn of Autumn. This lovely mare is a Welsh Section C x Arab and was a surprise addition to our team. I bought Summer 16 years ago – and got another one for free! We didn’t know she had Autumn with her. When I brought Summer home I asked our vet at the time to look her over and was advised she was a little overweight. Within a week we had a shock foal, discovered when we checked the horses at breakfast time. 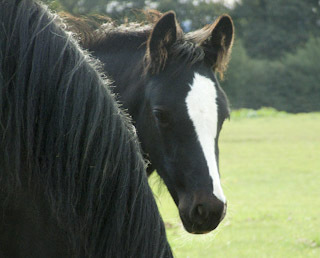 She was a beautiful little filly with four white socks and a white blaze. We contacted the previous owners and they said they had no stallion, so she could not possibly have been in foal. But we had the evidence! Then they admitted that they had had an 18-month-old British Arab colt running with their herd. And – surprise, surprise – he was chestnut with four white socks and a white blaze. Case proved! Autumn was always quite a strong minded filly and was always brave and a little bit feisty. 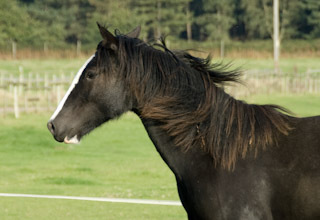 I started to train her at four and with all my patience and knowledge of natural horsemanship she still proved tricky. She always had her own opinions about everything! In the end the answer was to just get on her and ride her out. From the start she excelled and eventually became a push-button ride. 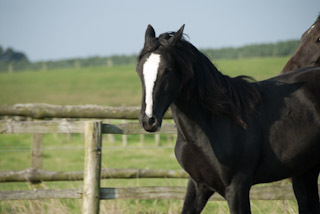 We find that with young riders and teenagers ready for their first canters she is the ideal choice. With her Welsh x Arab breeding she has plenty of stamina and she is very hardy. Autumn has a massive fan club from beginners to advanced riders, from kids to adults. She was a free gift who has turned out to be priceless. This handsome jet black boy is a Welsh Section D x Irish. He was home bred from Sophie, an Irish Cob mare who was one of my original trekking centre horses, bought when she was a five-year-old. Having had a couple of fantastic Welsh Section D’s from a local breeder I went back to look again and found Capulate as a youngster. I decided to keep him as an entire at first, so I mated him with Sophie. Sophie had a very calm nature and was one of the most comfortable horses I have ever ridden, while Capulate’s nature is very forward going and invigorating. So I ended up with something calm and sensible but with a little bit of the X Factor about him. From day one Atlantis was a bold and very affectionate youngster, aspects of his character which have stayed with him and he is now a great all-rounder. 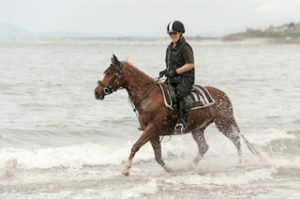 We use him as a lead horse and he is trained for horseback archery, yet he is so sensible and lovely to ride that he is very popular and a great favourite with our experienced riders. He is always enthusiastic and eager to please his rider. The only downside to this gorgeous and eye-catching boy relates to his conformation – he has a dipped back. Because of that I gave him plenty of time to mature and he wasn’t broken in until he was four and a half. My vet and I keep a close eye on him and after the two of us talked it over I decided to impose a weight limit on him. Only riders who are under 10 stone are now allowed to ride Atlantis, as I want to keep him sound and make sure of his longevity. Still, it’s a great incentive to keep the chocolate consumption under control over Christmas! Another first to aid our skills! Another ‘first’ to ‘aid’ our skills here at the trekking centre. 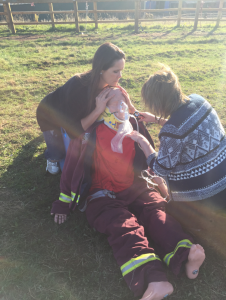 Yesterday I got my FPOS – First Person On The Scene – qualification. Now I feel confident I can deal with most scenarios after passing a fantastic first aid course that is the most advanced a student can take outside the emergency services. And I didn’t even have to leave home to do it – as our amazing new visitors’ centre is the base for the course and the plan is there will be a first aid course every month staged here. The FPOS – First Person On The Scene – courses are run by Duncan Parsonage and Mike Taylor, who have years of experience in the emergency services under their belts and now run Abacus Training. Successful students gain an internationally recognised BTEQ qualification. There were eight students on the first course, including me and even a couple of bodyguards who provide close protection for celebrities. And I’m happy to report a 100 per cent pass rate. It was so interesting and quite challenging and covered everything from cardiac arrests to fractures and major bleeds. The aim is that the first aider has enough knowledge and skill to keep an emergency situation under control until the paramedics arrive. I really feel confident that I can now do that, especially as the visitors’ centre has an excellent medical room, first aid resources and we also carry a defibrillator. 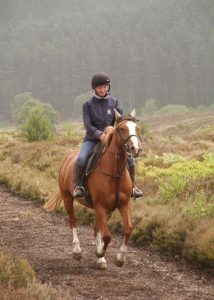 ​So, going forward me and my horse Chase could be responding to any medical incidents on Cannock Chase. With my close access to the Chase I could be called out to help as a first line of treatment and I am a lot more comfortable in any scenario. Abacus offer training from basic first aid right up to this qualification, which can be used as a stepping stone towards a job with the emergency services. 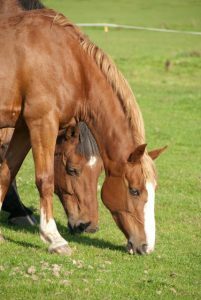 Duncan and Mike are so delighted with the success of the first course that they are now planning an equestrian version, aimed at people who work in the equine industry. The facilities we can offer here can provide all sorts of learning situations for the students. Anyone interested in joining a future Abacus course can contact the Trekking Centre. https://www.cannockchasehorsetrekking.com/wp-content/uploads/2016/11/IMG_06651.png 561 750 CCTC https://www.cannockchasehorsetrekking.com/wp-content/uploads/2017/11/cropped-icon.png CCTC2016-11-04 16:11:472017-11-23 12:28:15Another first to aid our skills!